Always in our view from Nead an Iolair are the many islands of Roaringwater Bay: sometimes they are referred to as ‘Carbery’s Hundred Isles’. 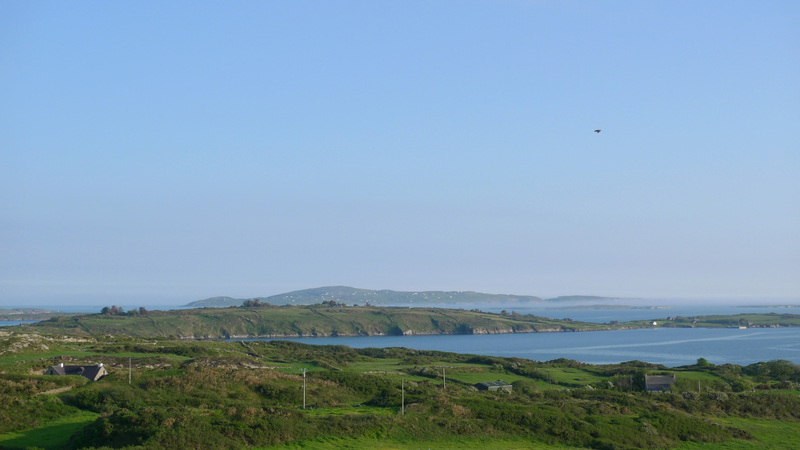 The largest of them – and the furthest out into the Atlantic – is Cape Clear. From our vantage point in Cappaghglass it sometimes floats on the horizon like a great seal under brooding skies, yet with the clarity of summer skies every hillside cottage can shine like a white jewel. 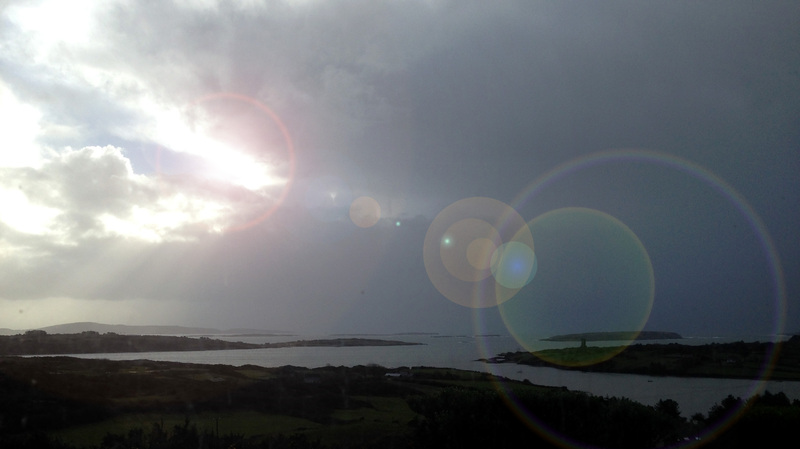 I visited the island for the first time last weekend, drawn to its isolation and history – and by its own Saint – Ciarán, born on this most southerly point of Ireland and preceding Saint Patrick by some generations as the ‘Apostle of Eirinn’. Cape Clear is a place apart. 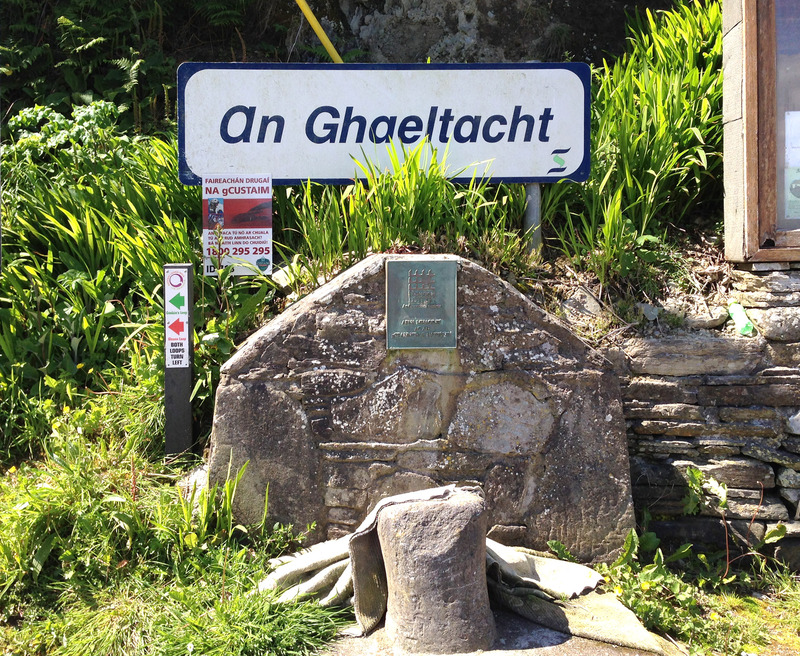 It is one of the Irish Gaeltacht areas – where Irish Gaelic is spoken as the first language. Oileán Chléire is the Island of Ciarán, and one of the first things to be seen after landing is an ancient stone by the quay – said to have been placed there by the Saint himself – and his holy well – while nearby are the ruins of an ancient church and burial ground. Saint Ciarán’s life has inspired some colourful stories. Before he was conceived Ciarán’s mother (Liadán) had a dream that a star fell into her mouth. She related this dream to the tribal elders who were knowledgeable of such things, and they told her that she would bear a son whose fame and virtues would be known as far as the world’s end. 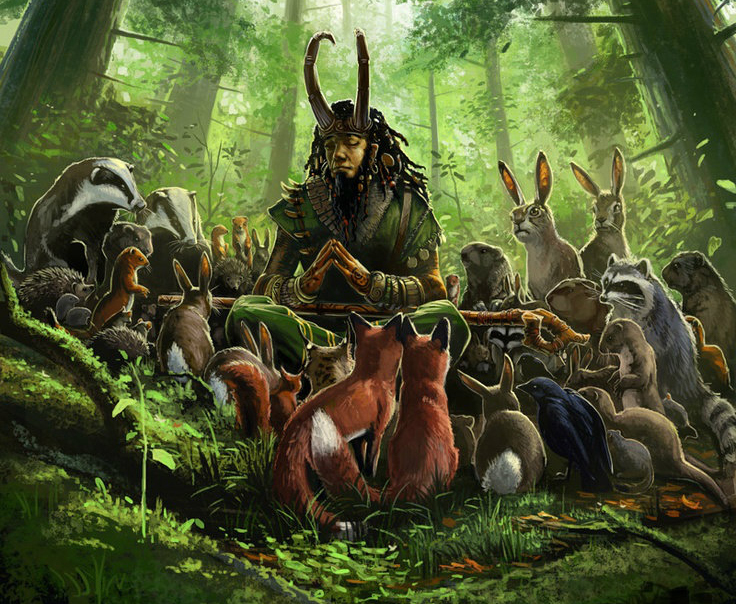 Ciarán’s first disciples included a Boar, a Fox, a Brock and a Wolf: they all became monks and worked together to build the community. 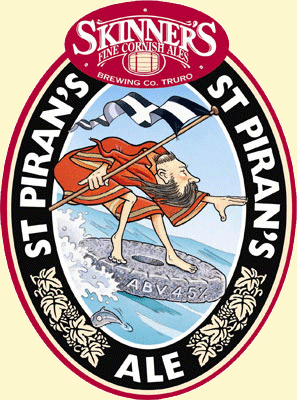 An unusual incarnation of the St Ciaran / Piran legend! The Saint is also recognised in Cornwall, where he is known as Piran (or Perran) – scholars argue that in some ‘Celtic’ languages the C sound is interchangeable with the P sound. Certainly there is a legend that the Heathen Irish tied St Ciarán to a millstone and dropped him into the sea – and he then floated across to Cornwall where he converted the Heathen Cornish. Whatever the basis of this, both Piran and Ciarán share the same Saints Day: March 5th – which is also my birthday – so that puts me firmly into the picture! Our visit was organised by the Skibbereen and District Historical Society, and was masterminded by past Chairman Brendan McCarthy. He had arranged for the sun to be shining all day, and for the sea to be the calmest that anyone had known for years. A bonus was the presence of Dr Éamon Lankford – a knowledgeable and erudite local historian and toponymist whose projects have included setting up detailed place name archives for Cork County, Kerry, and Cork City. There are now over 200 large volumes of historic place name references and the work is still under way: examples from the city survey include Black Ash, Cáit Shea’s Lane, Murphy’s Farm, the Snotty Bridge, The Shaky Bridge, the Boggy Road, Tinker’s Cross, Skiddy’s home… Éamon‘s unbounded energy has not stopped there – he has gone on to set up and run the Cape Clear Island Museum and Archive and written books on the Island’s people and landscape, on Saint Ciarán, on the Fastnet Rock, on Cape Clear place names- and has set up the Cape Clear Trail… Phew! We walked up the (very) steep hill to the Museum, which is housed in the restored old school building, and no-one could fail to be impressed by the sheer volume of information and artefacts it contains. Volunteers are needed to help run it through the summer months, so anyone fancying a bit of island life please make contact through the website. On our ferry trip from Baltimore and in the Museum Éamon kept us entertained and educated with stories, history and local lore. Rock Art – or Solution Pits? I was keen to visit the Museum because I knew it housed a replica of the passage grave art (carved stone) found on Cape Clear and now believed to have once been part of a passage tomb on the highest point of the island – Cill Leire Forabhain. In 1880 the original stone was turned up in a field and taken across to Sherkin by the then curate of that island to ornament his garden. He left Sherkin only a year later, and the stone became overgrown and forgotten. It was rediscovered in 1945 and given to the Cork Public Museum where it is now on display. The carvings on this stone are in the style of the other spectacular decorated stones in the Boyne Valley and at Loughcrew, rather than the simpler Rock Art we are working on in West Cork and Kerry (although this ‘simplicity’ is belied somewhat by the recent discovery at Derreennaclogh). Beside the replica stone in the Museum is a smaller piece of Rock Art, although debatably labelled as being caused by ‘solution pits’. 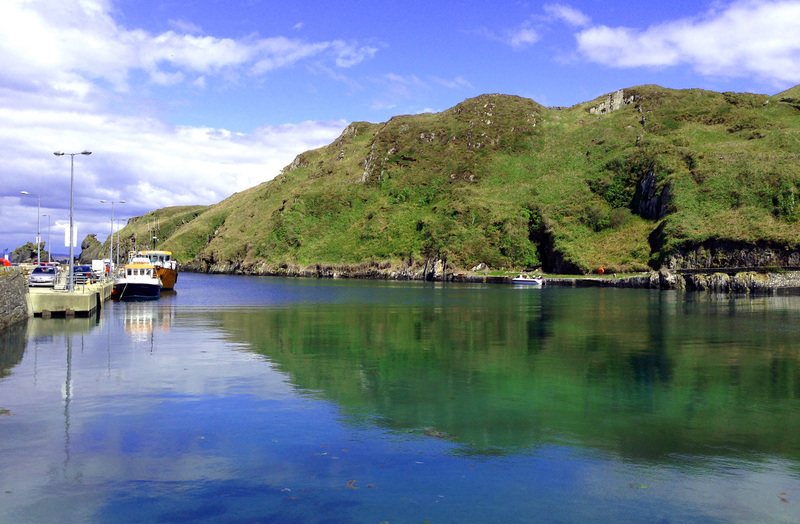 There is so much more to say about Cape Clear: it has given its name to a settlement in Victoria, Australia, supposedly named by gold miners from Ireland, and also to a number of ships built in Scotland. 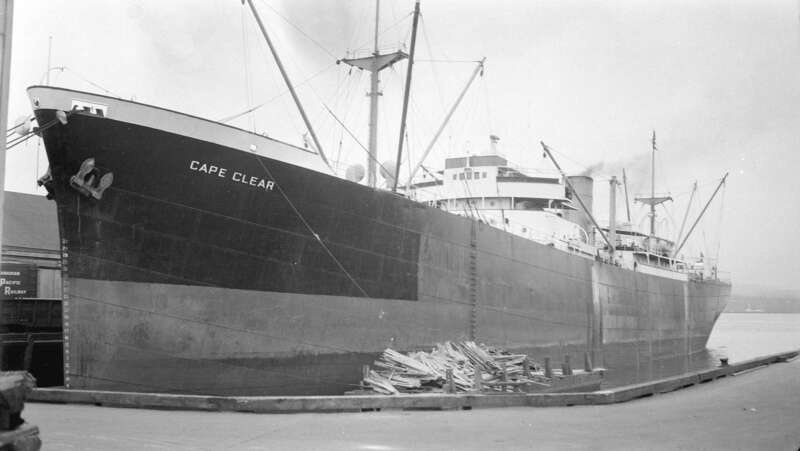 Talking of ships, the surroundings of the island have seen many a shipwreck: more than 50 wrecks have been recorded off Cape Clear between 1379 and 1944. 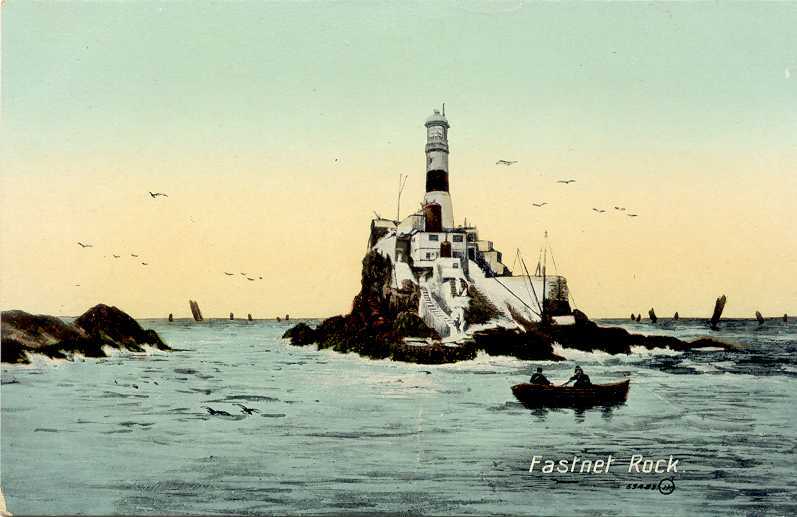 This is partly because of the proximity to the notorious Fastnet Rock. We have to revisit Cape Clear again in the not too distant future, when we can devote more time to a full exploration of the island: it comprises 7 sq kilometres and 16 townlands. This time, however, it was down to the harbour for an excellent lunch before embarking on the ferry for the next stage of the trip to…. But that story must wait until another time! For me, small island communities have a very particular feel: it’s not just the silence and closeness to nature, but a real awareness of how fragile, yet tenacious, the tenets of human existence / subsistence can be. As I write this, Cape Clear is romantically shrouded in mist out there over the bay: only the highest ridge, the cairn, the watchtower and the old lighthouse visible in grey silhouette. It’s a place that will pull us back across the water very soon.